disposal location, as supervised by and approved by Landfill personnel. The bags or containers shall not be allowed to “free-fall” to the ground. The personnel performing the unloading must be attired with required personal protective equipment and be certified asbestos abatement personnel. Homeowners who bring asbestos laden materials to the landfill in proper containers or bags must be capable of unloading their own vehicle. Landfill personnel will oversee that the material is properly deposited in the designated disposal area. 5. Non-friable (as defined by the DEQ) asbestos laden materials may placed in drop-box containers if the containers are lined as follows: a. b. c.
The box must first be lined with a minimum 6-mil sacrificial plastic slip sheet. Then the asbestos laden material must be enclosed by two layers of a minimum 6-mil plastic liner. Next the 6-mil plastic liners must be enclosed by a minimum 10-mil scrim reinforced plastic liner1. This will be the liner that makes first contact with the ground when unloading and the scrim reinforcement will keep the asbestos materials intact. Each seam on each layer of the liners must be independently sealed to create a leakproof seal, and thus encapsulating the waste. The seal must be adequately constructed so that the seal will not rupture during off-loading of the encapsulated waste from the drop-box container. DIRECTIONS TO DRY CREEK LANDFILL Travel on Crater Lake Hwy. toward White City Turn right onto Hwy. 140 Turn Right onto Entrance road, just past the state scales. Look for the Knife River and Dry Creek Landfill signs. Follow road as it veers left up the hill to our scale attendant office. Metal drums, barrels Plastic drums, barrels 6 mil. plastic bags or wrapping Leak-tight containerization for nonfriable asbestos waste material. Give an estimate of the total cubic yards of material. Print clearly the name of the company and their authorized signer. This section of the form must be signed and dated. NOTE: The waste generator must retain a copy of the completed disposal form. WASTE TRANSPORTER SECTION 8. Transporter #1: Acknowledgment of receipt of asbestos waste materials. Print agent and company name, then sign and date. Transporter #2: Acknowledgment of receipt of asbestos waste materials. Print agent and company name, then sign and date. NOTE: If there are more than two transporters attached a new waste shipment form. DISPOSAL SITE SECTION 10. Print name and title then sign and date for. 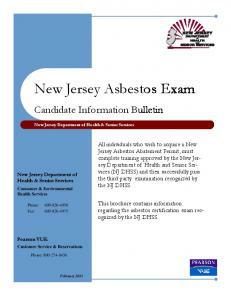 This certifies that you have received the asbestos material covered by this manifest. Discrepancy space. This space is used if there is a discrepancy between the amount of the material received by the landfill and the amount of material listed on the waste shipment form. Send a copy of the completed and signed Waste Shipment Form to the Waste Generator as soon as possible (but no later than 30 days after disposal) after the waste has been received at the disposal site. Notify DEQ immediately by telephone of improperly enclosed or uncovered waste. Submit a written report to DEQ the following working day, along with a copy of the Waste Shipment Form. If you discover a discrepancy between the quantity of waste designated on the Waste Shipment Form and the quantity of waste actually received, attempt to reconcile the discrepancy with the Waste Generator. You must report, in writing, to DEQ within 15 days after receiving the waste any discrepancies that cannot be reconciled. Submit a copy of the Waste Shipment Form with this report.